We’ve only ever published sweet rhubarb recipes: in compote, pie, preserves, even ice cream. 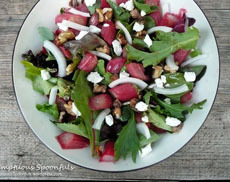 Today’s tip is: Try a savory rhubarb preparation before the end of rhubarb season, typically the end of May in the U.S.
We have a recipe for Green Salad With Roasted Rhubarb, plus links to savory recipes from sides to soups below. Rha is the Scythian name for the Volga River in Russia, the longest river in Europe. Rhubarb was cultivated by the Tatars there (“Tartars” is a misspelling), called barbarians—which referred to foreign people who were neither Christian, Greek nor Roman. Rhubarb has been grown for millennia. Chinese rhubarb (Rheum officinale) was grown for its roots, which were ground up and used medicinally as far back as 206 B.C.E. Garden rhubarb (Rheum rhabarbarum) was grown for its edible stalks (the leaves are toxic). Rhubarb seeds were imported to America shortly after the American Revolution. The term “pie plant” originated in the U.S. some time during the 19th century. Rhubarb was a popular pie filling and early American cookbooks show rhubarb recipes for cobblers, conserves, sweet pies and tarts. We adapted this recipe from CilantroCooks.com and added a number of optional ingredients, so you can customize it to your ideal. 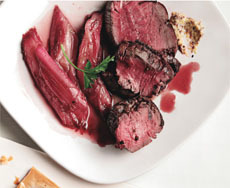 Top: Beef tenderloin with roasted rhubarb. Center: Roast chicken with rhubarb salsa. Photos courtesy Bon Appetit. Bottom: Rhubarb soup from La Cucina Italiana. 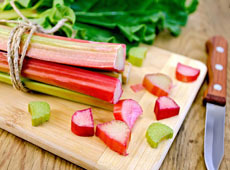 Top: Slicing fresh rhubarb (photo courtesy CilantroCooks.com). Bottom: A recipe variation from SumptuousSpoonfuls. Blogspot.com. 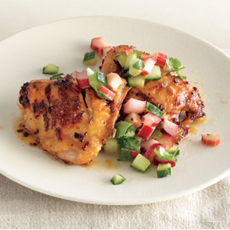 Their recipe roasts the rhubarb with honey and dresses the salad with a Honey Lemon Ginger Vinaigrette. 1. TRIM the tips (including all the leaves) and root ends from the rhubarb. Cut the stalks into 1 inch slices. Place in a greased (spray is fine) baking or roasting pan and roast in the oven at 375°F for 20 to 25 minutes. Remove from oven and cool (in the fridge, if necessary); half will be used for the salad, half for the dressing. 2. PREPARE the dressing: Place half the rhubarb and all other dressing ingredients in a blender or food processor; blend until completely smooth. Adjust the honey if you need more sweetness. 3. TOAST the walnuts: Spray a small baking sheet with cooking spray. Set the nuts on the tray in a single layer and toast on the bottom rack of the oven at 400°F for about 5 minutes, or until they are fragrant and slightly browned. Watch them carefully so they don’t burn. 4. 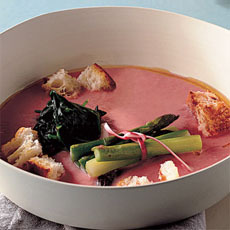 PLACE the vegetables in a large bowl; then add the completely cooled rhubarb and the cheese and toss with the dressing. Garnish with the toasted nuts and serve. *Sugar originated in Southeast Asia. The people of New Guinea were probably the first to domesticate sugarcane, possibly as early as 8,000 B.C.E. The cane juice from the stalks was used as a sweetener. However, the extraction and purifying technology techniques were developed by people living in India, around 350 C.E.